There was a lot of walking around town done on Monday. I walked to a client visit in the afternoon (my poor feet in actual business lady type shoes!) and then with some german friends visiting, we walked them around the city for a bit to show them some sights. Oye! Then we walked some more, decided that we wanted sushi, and then basically walked right back to where we had dropped off our visitors. 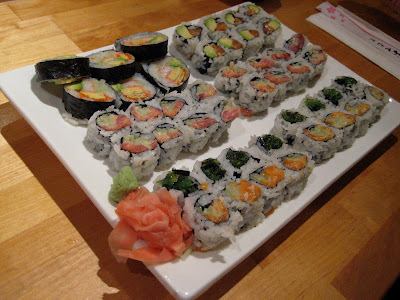 So anyhoo, we finally made a big circle and made our way to Vic Sushi. This is where we had tried to eat before on a Sunday and it was closed. Well it was open on Monday! Wahoo! The place is pretty much a pick-up place. There are… maybe 10 seats around the bar. And the place is just the sushi bar. That’s it. The menu is simple – sushi. We both got pretty much what I assume is the most popular order – their 3 roll special. I got a spicy tuna, alaska, and futomaki. J got spicy salmon, spicy tuna, and seaweed salad. We both got miso soup. The soup was lovely and light, not a particularly strong miso flavored soup at all. But I liked it just fine. The sushi was great. It came out surprisingly fast and it was all tasty and fresh. I think the fun of eating here is watching them make the sushi. The feverish pace is astounding. And they do brisk business, even on a monday night. I have to point out that the avocados were some of the most delicious and ripest I’ve had in awhile. I need to get in touch with their distributor! There’s no real service here. There are two ladies that bring out the non-sushi related stuff (cups, utencils, soups) but you’re pretty much served by the sushi chefs. Again, it’s mostly take-out so as far as dining in, it’s very laid-back and casual.